For the last two months, the question of the ecological catastrophe threatening our planet has been at the centre of attention in Belgium. With the march on 2 December 2019, which brought together 75,000 people in Brussels, this mobilisation around climate change has taken on an unprecedented breadth. Faced with the disdain of the government and the political parties, obsessed with all their squalid manoeuvres around the May elections, it got even bigger with 80,000 demonstrating in Brussels on 27 January. 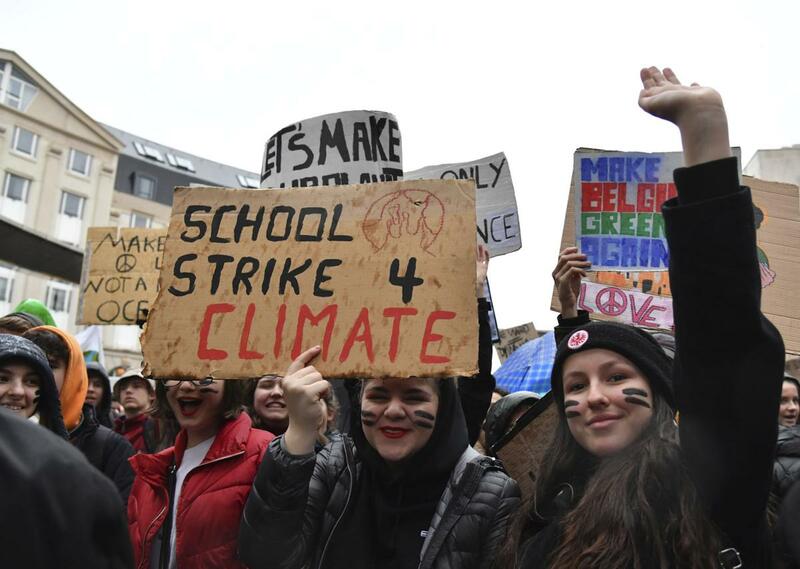 But the most significant expression of this indignation about the inaction of the political parties is without doubt the wave of Thursday school strikes, initiated by the high school students from the beginning of January, in order to go and demonstrate in Brussels. Launched by high school students in Antwerp, there were 3,000 students at the first demonstration and over 35,000 on Thursday 24th January, coming from both Flanders and Wallonia. Other more local demonstrations took place in Antwerp, Liège and Namur. The main motivation for this mobilisation of the high school students is the absence of perspective offered by this society on the issue of climate change. Scandalised by the lack of government action, the movement aims to put “maximum pressure on the authorities” to take responsible decisions about the climate problem. Indignation about the inaction of the governments is quite justified, and so is the disquiet of the students about their future, which also means their future as workers. The search for an alternative to this society which is heading towards disaster is more necessary and urgent than ever. But can we expect anything from the “authorities”? Should we not first and foremost think deeply about the real reasons behind the threat to the planet and its inhabitants? And about what kind of fight we need to deal with this threat? In order to provide some elements of a reply to these questions and to stimulate reflection, we are republishing here two articles on the question of ecology. Even though they were written in 1990 and 2009, they remain as relevant as ever when it comes to analysing the roots of the ecological problem and the perspectives that need to be put forward.